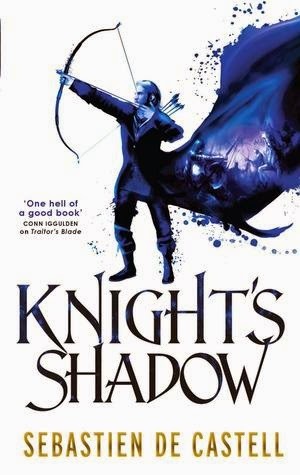 Knights Shadow is the sequel to Sebastien De Castell’s excellent debut, The Traitor’s Blade. For background purposes, the narrative is set in the country of Tristia, divided into several semi-autonomous Dukedoms, several years after a new king attempted to reform the laws and practices of the land, to give the common people a fair chance; the Dukes, jealous of their power, immediately rebelled and executed the king. The text follows fairly directly on from the end of the first book, and begins with the focus on the central character triad from the first book – three ‘Greatcoats’, travelling magistrates and duellists, empowered by the dead king to bring laws to a land determined to wallow in corruption. The world is gradually taking shape, a new piece introduced in a line of dialogue, or in a moment of character insight. Where Traitor’s Blade used the world as a platform to tell it’s story, and you could feel the bones of the background under the narrative, the world of Knight’s Shadow is more fleshed out, and feels a little more real. If you’re picking up Knights Shadow, you’re probably aware of the central characters already. I will say that the three of them continue to remind me quite strongly of the Three Musketeers, possibly intentionally – there’s the same witty banter, a certain grim joie de vivre, a bond of lucky escapes and noble failures. Falcio and friends are a joy to read about. That said, their interactions in this book are perhaps a little darker than in the first. They’re not exactly older or wiser, but perhaps a bit more damaged, following the events of the first text. Each carries their own scars, and De Castell isn’t afraid to show us that their actions have consequences – both personal and political. They’re joined by some old faces, but also a few new ones – the feisty, reasonably terrifying and possibly totally amoral Dariana, for one, quickly became a firm favourite. The dynamic between the characters is marvellous to read; they bounce between each other, and each moment of light banter raises a chuckle – but De Castell also keeps the emotional depth coming from each of them. Where it would be easy to create a light hearted fantasy, this text veers between the cheerier tone, descending into the grim, the grimy, the bloody – and uses that to showcase the personalities, the vulnerabilities, the centres of the characters. If the world is becoming more fleshed out, the characters are doing the same – we’re exposed to fears, acts of pointless bravery, cowardice, and a lot of moral grey areas – the latter being something that our heroes aren’t famously good at dealing with. This has, as mentioned above, consequences. From a plot point of view, the tone here feels a lot grimmer. The Greatcoats are beaten down, moving from crisis to crisis, tracking murders, dealing with their interpersonal issues, trying to stop glowing red all the time…there’s always something going on, and it’s usually not good news for the heroes. The pacing is pitch perfect, at least for me – each crisis feels like it rockets to a conclusion, desperately turning pages in an effort to find out what happens next…and then it finishes. And everyone takes a breath. And then the next crisis appears, and off we go again. I really couldn’t stop reading – especially as the narrative drove to a climax. Speaking of which, I won’t go into the ending for fear of spoilers, but I will say that it absolutely delivers. This is fast, fantastic fun –and it has an excellent character piece wrapped inside it, with some interesting things to say about people, how far they’ll go for their goals, and what they’ll find important. What they need, what they’ll betray, and how, ultimately, they define themselves. Also, it’s full of people getting their comeuppance (deserved or otherwise), a smidge of torture, and quite duels; overall, it’s a great read, and very much a worthy sequel.